On the fence about whether or not the Fisher-Price Jumperoo is the right baby jumper for your little one? If so, then keep reading because this article provides an in-depth overview of this baby gear option, which should help you make an informed buying decision. 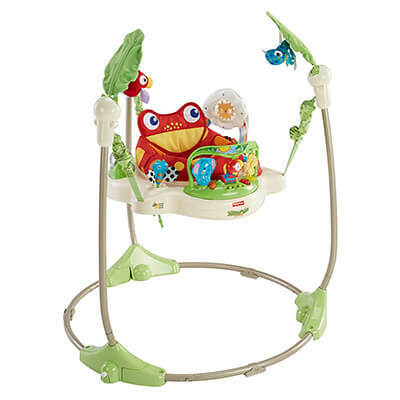 The Fisher-Price Jumperoo is one of those baby equipment selections that has all kinds of features and benefits, something that makes it a top quality baby gear option. Sturdy standalone set-up with a newly designed frame that pivots to a nesting position. A weight recommendation of up to 25 pounds. Made from materials that are durable and easy to clean. The suspension system that is covered with a soft, protective fabric. A plush seat that rotates. Colorful toys situation in five different locations along with hanging toys, bright lights, and exciting sounds. A motion sensor that encourages movement. Fun rainforest theme and attractive color scheme, featuring light green, red, white, and beige. Provides your little one with a safe place to play and burn off energy. Stimulates your son or daughter to get moving with its motion sensor that activates the jumper’s lights and sounds any time he or she jumps, moves around, or spins. Can be taken anywhere since it’s lightweight. Also easy to store with its foldable, nesting design. The Jumperoo grows as your baby grows thanks to its three height adjustments. After doing some far-reaching research online, we found that there were a lot of parents who were willing to share their opinions, both good and bad, about this Jumperoo from Fisher-Price. How it was very, very easy to set up and most noted that it took about 15 minutes or less. That it’s an extremely interactive jumper, which kept their sons or daughters happily occupied for longer periods of time. Happy that it could be taken anywhere and that it was adjustable, so, parents could still use it even if their son or daughter when through growth spurts. That it had a nice overall look and that it wasn’t an eyesore like other kids toys tend to be. Since the lights and sounds ran on AA batteries alone, parents became frustrated with having to constantly change them. Some parents though it was a bit pricy. There were a few parents who thought the jumper was too stimulating for their baby and chose to keep the batteries out of it so their son or daughter wouldn’t experience sensory overload. When buying a baby jumper, or other equipment for your baby, you need to be smart about what you’re doing. Make sure you have enough room for what you before you buy it so your little tyke can actually use it. If you want to get the jumper at the best possible price, do price comparison shopping and remember to take advantage of other coupon codes and deals. Don’t buy anything at the spur of the moment because you could end up being sorry later on that it wasn’t quite what you were looking for. All in all, the Fisher-Price Rainforest Jumper is a quality baby gear selection. However, if you’re still unsure about whether or not it’s the right jumper for your baby even after reading this review, you can learn more about it by doing your own research online. That way, you’ll really be able to make an informed buying decision.